"Moist, spicy, and nutty, these bars are healthy snack as well as a treat." In a large bowl, cream together the butter, white sugar, and brown sugar. Mix in eggs and 1 teaspoon vanilla until fluffy. Sift together the flour, salt, and baking powder; stir into the creamed mixture. 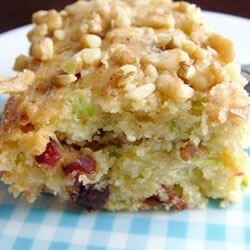 Stir in the coconut, dates, raisins, and zucchini. Spread batter into the prepared pan. Bake in preheated oven for 35 to 40 minutes. To make icing, mix together melted margarine, milk, 1 teaspoon vanilla, cinnamon, and confectioners' sugar. Drizzle icing over the bars while still warm. Sprinkle chopped nuts over icing. Cut into bars when cool. Very moist. I added cranberries (dried) because I didn't have dates and added chocolate chips. I would not do cranberries again but otherwise very good!